Easy way to add custom data to your website. Create custom fields for your pages and posts, or global options for your website. You can create sets of fields of any kind and assign them to pages, posts or administration screens. This way you make it easy for the editors to insert extra content or change options that affect the appearance and funcionality of your website. Why you need custom fields? When a user is editing a post he/she can enter some certain data: the title, the content, a featured image, some tags, etc. If you want to let him/her enter more data, for example a subtitle and a second image, you need custom fields to hold these data. Another example would be about page editing. If for example you have a page template with a special background or some custom banner, and want the page editor to easily change that image, you must use custom fields. With ACTUS Xfields you can easily create sets of custom fields and assign them to your posts or pages. Assign fieldsets to pages or posts, according to a number of criteria like template, parent, category, tag etc. Create a custom administration page for your website’s options. Click on ACTUS Xfields on WordPress menu sidebar. Click on the ADD FIELDSET button to create a fieldset. Type a title for the new fieldet. Drag fields from the bar on the left to the box under the MAIN GROUP label. Create a target for your fieldet to assign it to the posts or pages you want. 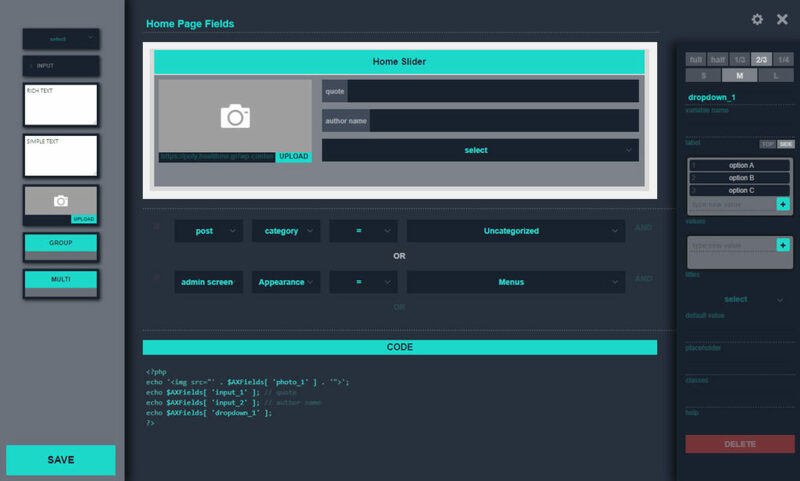 On the bottom of the screen is the code box, where you can see the names that your variables will have in PHP.